He stood on the snow covered floor of a frozen desert and looked around. How anyone could possibly think to find gold there was beyond him. Nevertheless he shrugged his heavy green coat up higher, burying himself in the warmth of it and stepped back onto the ship. Nick had been aboard the ship for 3 months, with only a short stop at Greenland. Ship life was not the life for him, and with every cold breath he inhaled he dreamed of the day he'd retire in some warm tropical paradise. Remembering quite suddenly it was turn to feed the animals, he headed down towards the holding area where they had livestock. All in all there were about 25 horses. Nick walked down the line of stalls giving a mix of oats and apple cores to each horse. Having been told the ice would support the weight of the beasts, they had brought them along. At the end of the line Nick came to his ride, a brown creature with a long awkward face. When they had tried to force a horse upon Nick, he had refused, stating that they couldn't be trusted in the snow. After arguing back and forth for awhile, an alternative had been reached. Nick now took special care, patting the head of his reindeer as he fed it from his hand. As he stood there with the animals, a groaning like metal twisting sounded throughout the ship. Nick quickly sped through the corridors heading to the bridge. The ship's groaning grew louder as the floor began to shimmy. Outside the ice had come up quickly. Despite the efforts of the captain and crew the ship had pushed itself straight into the frozen plain. At last the ship came to a stop, completely wedged in. Everyone was on deck and staring around. They had been told to expect a cold and barren landscape, but nothing had prepared them for the field of endless white that stretched out before them. The first thing they did was to try and reverse the ship, but with negative results. After some discussion it was decided that half the crew would go ahead on foot and make camp, while the other half stayed behind and tried to free the ship by hand. They crew drew lots and Nick found himself saddling up his reindeer. Along with Nick was Thomas Bailey a tough, redheaded Irishman that Nick had grown close to. They ran behind 8 other men. They were each weighed down with packs and tents and miscellaneous tools that jingled as they moved. Above them the sky was clouded over, casting a gray pallor over everything they passed. A light wind blew steadily, keeping the powder on top of the banks swirling around the hooves as they crunched methodically on the ice. After about 20 miles they found a clear stretch of ice that was banked on three sides snow. Trusting that the ice would be strong enough they hammered their tent poles securely into the ground. Thomas and Nick shared a tent. Inside they discussed what had been on everyone's minds since they'd arrived. Where exactly were they supposed to find gold? Each pair stayed inside their tents as night closed in. The wind was starting to whip up heavier now and the tent rippled as Thomas and Nick did their best to stay warm. Eventually they fell into a restless sleep. The world they awoke to was not the one they'd closed the tent on. All the landmarks had been blown away, as had their tracks. And the biggest blow, all of the horses but three were dead. Nick's reindeer had also survived. None of the remaining animals looked particularly well. The crew felt defeated. One day into the excursion and they already knew it was a failure. Packing up what they could on the four animals, they began trudging back towards the ship. With the ship long out of sight, they had to rely solely on their compasses. They quickly found the return to be much harder. Without the horses doing the work, they quickly tired and had to take frequent breaks. About halfway they made camp. The talk in camp was marked by fear. Some made jokes, but they were just trying to cover up what they all felt. Questions about whether or not the ship had been freed wore themselves into what little sleep they got. Despite their best efforts to keep the horses warm, the next day found just one and Nick's reindeer alive. Each one left more things behind. As they marched along no one talked. their bodies were dehydrated, and a couple of them were already on the beginning stages of pneumonia. Jefferson Mikes had taken the lead. He was a man marked by his muscular build and dark black hair. He was the one who first heard the ice shifting. Not knowing what it was though, he stood still listening. Then in a second as the other watched, Jefferson Mikes, and two others disappeared from sight. In their place a large crack split the ice open. Those remaining scattered quickly to either side of spreading chasm. With 3 miles to go, everyone except for Thomas and Nick were pressing to break. Nick and Thomas left them the horse but pressed on alone with the reindeer. Those who stopped to rest never got up again. Each step was murder, and with each breath it felt like a knife driven into their chests. Nick led with Thomas matching step for step. At some point, Nick noticed that the echo of footsteps had disappeared. Nick looked back, but his friend and the reindeer were both gone. When Thomas had fallen he couldn't say. Nick continued on and at last reached the edge of the ice. The black water sloshed up against the sides of the ice, showing where the ship had been. They had managed to free it, and then assuming the rest of the crew lost had sailed away. Nick sat down by the side. He wanted to cry but it was just too cold. He had never said a prayer in his life, but at that moment he said his first. 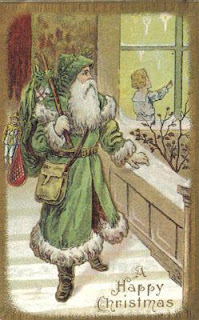 He knew there was no hope for him, he just prayed that God would take care of Mrs. Claus. Nick reached into a pocket and retrieved his matches. He searched for paper in his sack and found a paper that had his alias, Kristopher Kringle of Santa Pola, written in his shaky handwriting. Just a few seconds of warmth was all he wanted. He watched the fire spread up the paper till it reached 'Pola.' Just as the word was disappearing, the flame blew out. Nick breathing heavy, his heart rate starting to slow, laid down on the ice. Right before he slipped into unconsciousness he saw what looked like very tiny men, no bigger than toddlers, walking towards him. Six months later Mrs. Claus received a letter from Greenland. In it just two words were scrawled.